Colouring books for adults are one of the world’s top leisure (and book-publishing) trends. Quivertree’s unique, all-South African colouring book is beautifully drawn by up-and-coming young SA illustrator Mieke van der Merwe, and enables its interactive users to feed their imaginations with quality creative time. 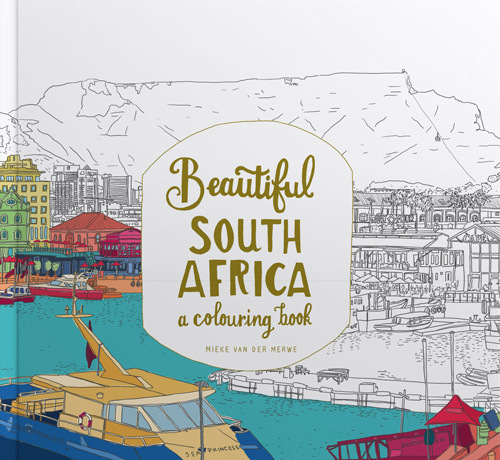 With intricate illustrations ranging from proteas and fynbos to the Joburg skyline, the Big Five and the Bo-Kaap, this book will help you take a fresh and inspiring new look at the beauty of our diverse – and unique – country. Colouring books for adults are currently one of the top-selling categories of books worldwide. This title addresses the need for a locally created version that features all South Africa’s loveliest icons and most beautiful places. Large tourist audience as well as local buyers. Mieke van der Merwe recently completed a master’s degree in children’s book illustration at the University of Stellenbosch, where she is currently working as a part-time lecturer. This talented illustrator says she ‘loves to draw special places, buildings and my travels’ and reveals that she is ‘inspired by vintage magazines, the weird and wonderful things of life – and interesting people’.